Known for their lovely colors and hardiness, Tube Anemones make prized aquarium inhabitants! 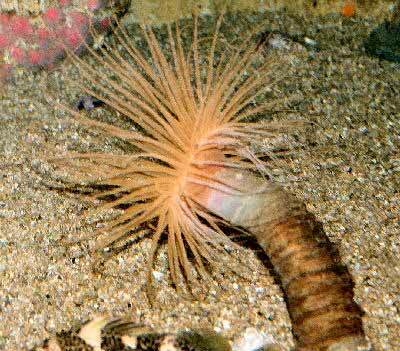 The Tube Anemone is also commonly known as a Tube-Dwelling Anemone or Burrowing Sea Anemone. They are soft bodied, solitary animals, best known for the long 'tube' that they dwell within. Some beautiful specimens can have a body tube over 27.5 inches (70 cm) long. It was previously believed that they created their tube by releasing mucus, which then become covered with sand. Today however, it is known that they create the tube by releasing threads of a special type of nematocysts called 'ptychocyst'. The result is a woven fibrous structured of stinging cells that help protect it from attack. Like the 'true' sea anemones, the Tube Anemone also has a beautiful crown of tentacles. The tentacles are bioluminescent on many species, and they use this to startle fish, thus keeping fish from nibbling on them.The tentacles are non-retractable, but if frightened or disturbed the tube anemone can instantly withdraw its whole body into the tube and become hidden. Tube Anemones relocate by leaving their tube and relocating to another area where they dig in and construct a new tube. They move by slowly crawling along the surface and then digging into the sandy substrate. Once they bury themselves into the sand, they then construct a body tube. If there is a strong surge of water, they can sometimes be dislodged from their tube and are then left floating in the current until they can settle again. This tube anemone like others in this family are best kept by advanced aquarists. The depths of fine sand, enough oxygen, yet low water flow and constant feeding makes it very hard for the large majority of marine aquarists. They may look great one day but are dead the next. They need a chiller, pristine water quality and lots of room so other corals and fish are not stung. Tube Anemones or burrowing sea anemones belong to the order Ceriantharia, and consist of approximately 50 species found in oceans worldwide. They are often found most populated in waters where the plankton is very dense. Phytoplankton blooms, zooplankton, and excess detritus also result in population increases of certain species. Tube anemones have a long and cylindrical, somewhat cone-like body, typically between a few to several inches long. Unlike sea anemones, they don't have the sticky foot used to adhere to a hard substrate to anchor them. Rather they have a rather pointed foot that they can widen into a bulb like shape, creating a motion that helps them burrow and anchor into the substrate. For their prosperity and health they depend on about a 3" to 4" (8 - 10 cm) layer of sand. Tube Anemones, like sea anemones, have an oral disc on the upper part of their body covered with tentacles. But they differ in that the tentacles are arranged in dissimilar pairs with each pair having a shorter tentacle near the mouth and a longer tentacle well armed with stinging cells near the margin. When extended, the tentacles become long and thin resembling threads or filaments. The oral disc has a small mouth in the center and is covered with many tentacles, giving it a crown-like or flower appearance. Another difference between them and sea anemones is that their mouth has only one ciliated siphonoglyph, while the true anemones have two. The siphonoglyph is a groove leading from its mouth to the stomach, or gastrovascular cavity. Being ciliated means there are fine hair-like projections lining the groove, which help pump water into the cavity, inflating the body. All members of the Ceriantharia order reproduce sexually. Unlike the true anemones, they do not reproduce through asexual means such as fission, where the anemone is divided or split into parts to create a new anemone. Only one tube anemone species is said to be able to reproduce through budding. Most species of Tube Anemones are hermaphrodites, meaning they are both male and female. At a smaller size it is a male but after crossing over to a larger size/age, it will turn into a female. Each animal can produce both eggs and sperm, but they do not produce them at the same time, so it takes two specimens to produce a zygote. The Zygote is a fertilized egg, the beginnings of a new Tube Anemone. How they provide brood care is not fully known, though some species have a tentacled larval stage that extends into the planktonic phase. How long Tube Anemones will live is unknown, but they can be very long lived. Specimens introduced into the aquarium of Naples when it was first established are still alive today, and that was well over 100 years ago. In the aquarium Tube Anemones make a colorful and hardy display, and they are relatively undemanding. They can be moderate to care for since they do have specific needs. They require a lot of space and must be in a large enough aquarium to satisfy their burrowing behavior and ultimate size. For those that are cold-water species, a chiller will be needed. Tube Anemones are filter feeders. In the wild they are primarily planktivores that eat protozoans from the water column. By swinging their tentacles back and forth they can actively swim and capture prey. In the aquarium they will readily consume small pieces of frozen foods such as Artemia, frozen plankton, mosquito larvae, and water fleas, chopped mussels, fish, and shrimps, and even crushed tablets and flake foods. Large pieces of food are poorly digested. Feeding 2 or 3 times a week is usually sufficient. In the wild they primarily inhabit sandy and muddy surfaces near a reef. In captivity a typical reef environment with a sandy substrate is needed for them to burrow into. A simple biological filtration system is generally adequate, but adding a protein skimmer will help with the water quality. For those that are cold-water species, a chiller will be needed. They must have a deep fine sand substrate, with enough depth to accommodate their total length. Hitting a bare bottom, as well as trying to burrow through course gravel (rice sized or larger), will prevent them from finding a spot to burrow and settle. This can cause them to stress and die. Minimum Tank Size: 20 to 40 gallons (75 - 150 L) with at least 2" to 4'" of substrate is recommended, depending on the species. Tube Anemones are semi-aggressive, yet as far as "anemone" type corals go, they do not have as powerful of a sting as true anemones. Several Tube Anemone specimens of the same species can be kept in an aquarium, but they are not compatible with other tube anemone or sea anemone species. Be careful to keep all stony corals, leather corals, and colonial anemones out of reach. A sting from a Tube Anemone will kill these inhabitants. Tube Anemones don't get along with most fish; large fish disturb them and cause them to withdraw while small fish are usually stung. Some fish to avoid are triggerfish, pufferfish, and large angelfish. Pipefish and seahorses should also not be kept with them as they inevitably brush up on them and are stung. In the wild, some species of burrowing sea anemones have been known to live commensally with a variety of crustaceans and worms, Small crabs, bristle worms, and others are found in or around their tube. In the aquarium, large crabs, lobsters and big snails need to be avoided. Small hermit crabs and shrimps, as well as most worms, work fine. Be sure to learn about the type of tube anemone you want so you can determine its needs and its suitability for your aquarium. Tube Anemones vary by species in their aquarium hardiness and difficulty of care. Successfully keeping a burrowing sea anemone is often dependent upon choosing a healthy specimen when you buy sea anemones. When selecting a sea anemone it is important to choose not only a hardy specimen, but also a healthy specimen. Problems for the Tube Anemone or Tube Dwelling Anemone are pretty minimal if they are provided with an adequate environment and fed regularly. There is not a lot is known about potential ailments, these anemones seem to be either alive and very well, or dead. When choosing a tube anemone make sure the color is good, the mouth is not gaping open, and there are no tears. When being removed from another aquarium, a healthy specimen should immediately retract, ejecting the water from its mouth. Check that the tube is intact and in good condition. If the tube is missing, that can create challenges. Although they can re-grow the tube, it takes a lot of energy that sometimes will deplete the animal into a weakened condition. If they have difficulty creating a tube, you can provide a section of acrylic tubing for it to live in. Place the tubing at an angle in the sand, but be certain that both ends are unobstructed and there are no sharp edges. Monitor the new arrival closely for any decomposition problems.